Brand new sealed 180 gram double album. Made in the EU. Take metal’s most successful band, couple that with an eight-year gap between albums, and add in almost universally positive response to the singles released so far and you have sky high expectations for Hardwired…To Self Destruct. But the expectation are always high for Metallica, who don’t pay much attention to outside influences and work at their own pace. While their early albums were fairly streamlined, they have all been at least an hour long since 1988‘s …And Justice For All. The new effort, Hardwired…To Self Destruct, is actually a double album, with its 12 songs clocking in at more than 77 minutes. Only 1996‘s Load is longer. The opening track “Hardwired” is by far the shortest, blazing by in just over three minutes. The song’s lyrics weren’t meant to describe it, but the refrain “we’re so f–ked, s–t outta luck, hardwired to self destruct” resonates with many after the presidential election. While their last album Death Magnetic was criticized for sounding overly compressed, that’s not an issue with Hardwired…To Self Destruct. Greg Fidelman, who was an engineer and mixer on Death Magnetic, was the producer this time around. He has worked closely with the band over the past several years, co-producing Lulu and overseeing the live soundtrack to Through The Never. 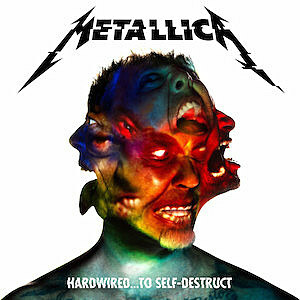 Hardwired…To Self Destruct finds Metallica building on what they did on Death Magnetic instead of starting from scratch, while also incorporating elements from earlier albums ranging from Kill ‘Em All to Master Of Puppets to Load. The result is an album that’s familiar and comfortable, but also propels the band forward.